Excerpt: Download the full report. Oil and energy organizations are in a unique situation when it comes to digital transformation. While most industries have been forced to implement new technologies in order to compete with more nimble, digitally-native startups, established companies in oil and energy are inherently harder to disrupt given the regulatory landscape and natural limitations imposed by physical infrastructure. 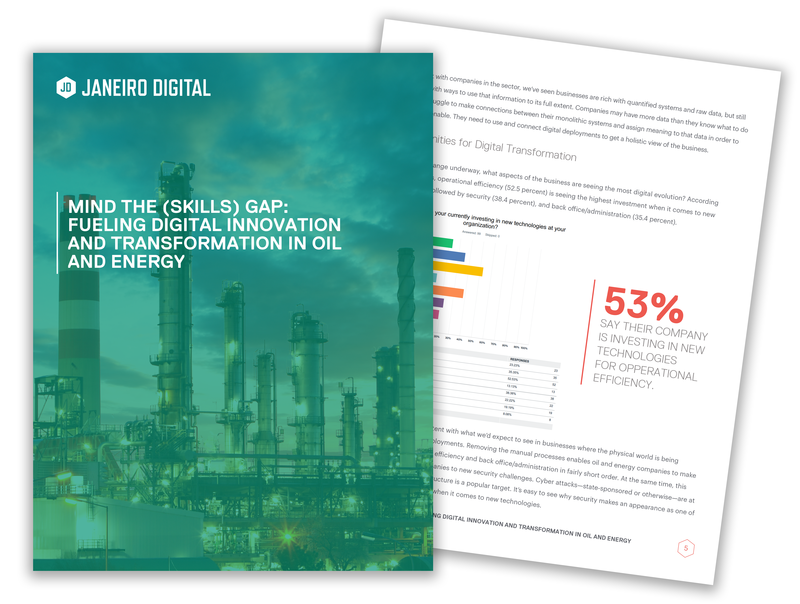 To better understand these challenges, we surveyed 99 middle and senior-level managers in utilities, energy, and extraction to learn about their progress, current challenges, and forward-looking opportunities when it comes to digital technologies and digital transformation. The findings reveal that these companies have been quick to adopt new technology, but are still exploring how their innovations impact business strategy and translate to market leadership. Despite a daunting skills gap, oil and energy companies are primed for growth as they streamline their infrastructure and optimize their existing deployments. When it comes to implementing new digital technologies, utilities, energy, and extraction professionals reported an exciting pace of change is occurring within their organizations. In conjunction with the digital maturity demonstrated in earlier findings, it was interesting to see that the majority of respondents (53.5 percent) still viewed their companies’ digital transformation initiatives as “average” compared to others in their industry. In fact, only 1 in 5 (21.2 percent) saw themselves as ahead of the curve, while another quarter (25.3 percent) reported that they were lagging in digital maturity. 54% SAY THEIR COMPANY’S DIGITAL TRANSFORMATION INITIATIVE IS AVERAGE. More than half (54.6 percent) said their organizations are currently implementing new technologies, with another 16.2 percent looking to do so in the near future. Only 10 percent reported that they weren’t implementing new technologies, and were content with the status quo. Partially driven by necessity, oil and energy companies have been quick to adopt digital technologies connecting their physical infrastructure to the IoT. Sensors tracking everything from temperatures and pressures to physical and digital security have quickly become the industry norm. This makes it easy to see why oil and energy companies appear to be so far ahead of their counterparts in other industries when it comes to digital maturity. As the next question highlights, however, these companies are still lagging when it comes to enterprise software and what they get out of it. 55% ARE WORKING TO IMPLEMENT NEW TECHNOLOGIES. With so many oil and energy companies reporting that they’re deploying new technologies, how is it possible that such a large proportion simultaneously identify as average or behind the curve? This may come back to the fact that these companies have rushed to deploy sensors and take advantage of IoT, but without a deeper level of strategy in place. In our work with companies in the sector, we’ve seen businesses are rich with quantified systems and raw data, but still grappling with ways to use that information to its full extent. Companies may have more data than they know what to do with, but struggle to make connections between their monolithic systems and assign meaning to that data in order to make it actionable. They need to use and connect digital deployments to get a holistic view of the business. So, what’s holding digital transformation efforts back? Download the complete, 13-page report, to learn more about our findings and how to overcome common challenges.